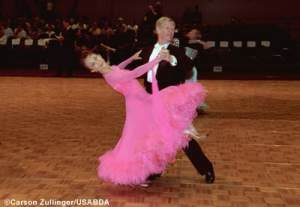 USABDA – The United States Amateur Ballroom Dancers Association. You might expect a big dancing town like Los Angeles to have a large chapter of USABDA, but in early 2003, there is only a mostly defunct Greater L.A. Chapter, which is not only less great than it once was, it’s virtually completely disbanded. Enter one enthusiastically devoted amateur ballroom dancer by the name of Alexandra Caluen, and her quest to create a long overdue West LA chapter of USABDA. There is no shortage of social ballroom dancing in West LA, mostly thanks to well-known teachers such as Russell Adcock and Michael Kuka, and there is more East Coast Swing, Salsa and West Coast Swing than you would ever have time to do, but USABDA is only partly about social dancing. 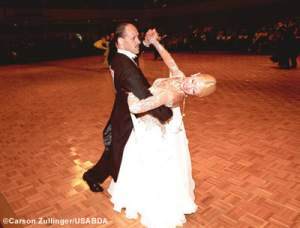 As the national governing body for amateur ballroom dancing and DanceSport (the competitive version of ballroom dancing) in the United States, USABDA encourages its members to compete and perform as well as to waltz the night away for purely social reasons. If you join a chapter of USABDA, you had better be prepared to be encouraged to recruit new dancers, dance with new people at the socials and also to learn a performance routine or two as well as give serious consideration to entering a dance competition. And why not? 99% of social dancers already know it’s all about the dance itself. A ballroom party is no place to cruise for your next date. The dancing and the constant quest to improve upon it take precedence over everything else. And attracting beginners is essential. Many ballroom events are filled with beautiful souls who are almost too old to go on a cruise ship. As cool and fabulous as these more mature people may be, the only hope for the future of ballroom is the constant influx of younger and younger new dancers. With Salsa and Swing being so popular, there are plenty of potential recruits, but there is often an image misconception with ballroom dancing. For example, unless a Salsa Dancer is exposed to the visual wonders of advanced competitive Latin dance, they are not going to be able to erase the image of nice old grannies doing a gentle social Cha-Cha on the community center floor on a Saturday night. Unless a Swing Dancer actually witnesses a high-speed continuity style Foxtrot, they are not going to have any inkling of how amazingly cool that is. They are going to see the word “Foxtrot” through glazed-over eyes. USABDA is like an outreach organization that spreads the word to the unconverted. We dance because we evolved enough to be able to dance, and it feels even better than it looks. 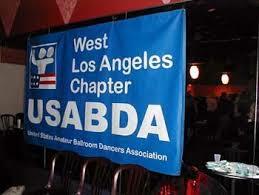 USABDA is a way for there to be more Ballroom Dancers, and better Ballroom Dancers. So there was this void in West Los Angeles. In this case West Los Angeles also includes a 30-mile arc around West Los Angeles, and Alexandra Caluen decided to take some action to fill the void. Alexandra even bought everyone dinner following the second meeting that took place to discuss the formation of the chapter! the-vu: When did you first become aware of the existence of USABDA and the lack of a local chapter? Alexandra: I don’t remember the actual first-heard-about-it moment, but I suspect that I saw an ad placed by USABDA in a magazine called Dancing USA. I joined fairly soon thereafter, and this would have been within my first year of dancing ballroom. As to the local chapter, Greater LA lost its entire board of directors last year. We thought and talked about if for a couple of months after receiving an appeal from the regional vice-president; when no one else stepped up to revive a local chapter, I took a deep breath and dived in. You met your husband Phil in dance class? Yes indeed. We both started lessons in August 1997, by November were practicing together, and New Year’s Eve was our “first date.” We got married October 6, 2001 and yes, we danced a lot at the reception. How long had you two been dancing before you decided to pin on a number and compete? I believe it was in January 1999 and we were still quite bad. J But competition has proved to be the best motivation for us to continue improving overall, to stay in group-lessons, to take private lessons. For me it’s also quite exciting since I was never athletic before. Phil did some biathlons before we met, but for him also ballroom has become an excellent outlet for that competitive urge. What has been your greatest success so far in competition? We placed first in a “Silver” level three-dance event (cha-cha, rumba, and swing) at USABDA’s 2002 Nationals. Big thrill, major thrill. How much help and encouragement, with regard to the formation of the chapter, did you get from your teacher, Russell Adcock and others in the professional dance world? Russell has always encouraged us to participate in USABDA and has been very open-minded about how he might help. Professionals aren’t allowed to actually organize events, of course. Michael Kuka and Thomas Hicks (other local instructors) are also both actively supporting social ballroom and competitive ballroom. If the West LA Chapter looks like it won’t be happening after all, at what stage do you think you’ll pull the plug on your time and personal expense? If after one year we have the chapter chartered, and have scheduled our first social dance, and have organized one promotional event, I will keep on with it. I don’t have the kind of ego that will require me to flog any dead horses. All I require is a moderate level of interest and commitment from enough other people to actually pull off the events we all want. How will the chapter encourage social dancers to learn a performance routine or enter a competition? I hope that the chapter will fall out, structurally, into a sort of tree. The trunk will be the social dancers who both attend and organize the chapter dances. The branches are competition, performance/outreach, college/youth programs, a formal dinner dance, etc. 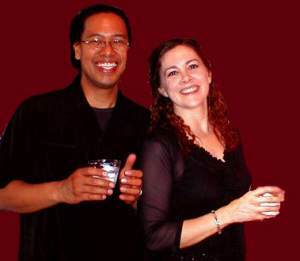 We would encourage couples who dance socially to learn a routine so they can perform it at chapter dances or outreach events; we would also encourage singles to find partners for the same purpose. Those couples might then very likely be tempted to begin competing. Once you get over the initial stage fright, the performance aspect can be addictive, and if you are at all competitive, the prospect of winning a medal or trophy can be that extra motivation you need to really perfect your technique. Ultimately, in order to attract those who haven’t considered ballroom dancing before, we need to present it in all its forms: social, competitive, whatever. The point above about “club” dancers being attracted to ballroom by the variety it offers is one that I hope we will make over and over again in our promotional efforts. The catch is that those dance clubs really are predominantly places for the younger, dating crowd. So not only do we have to frame USABDA events in such a way as to arouse the curiosity of club dancers, we have to take our message into the clubs by offering short lessons or demonstrations in the other dances that can be done to the same sort of music in the same sort of ambiance. If people like dancing at all, seeing something new will often inspire a wish to add it to their repertoire. If our hopes are realized, that wish will bring young people into the ballroom studios and they will start to enjoy all the glamour and romance of traditional ballroom, as well as the excitement of DanceSport. If your readers are interested in learning more about USABDA, there are pages & pages of information on its website: www.usabda.org. And so at the time of writing, it is not yet certain that Alexandra will meet her goal, and that there will be a West Los Angeles chapter of USABDA, but if it doesn’t get off the ground, it will be a loss of opportunity for the area, and for every person that does not learn to dance, it’s a life wasted in the mediocrity of sitting still. Jeffrey the Barak is the publisher of the-vu, and an enthusiastic social dancer.